It's time for Featuring Studio Spaces! Each week we will feature an artist and his or her creative space. 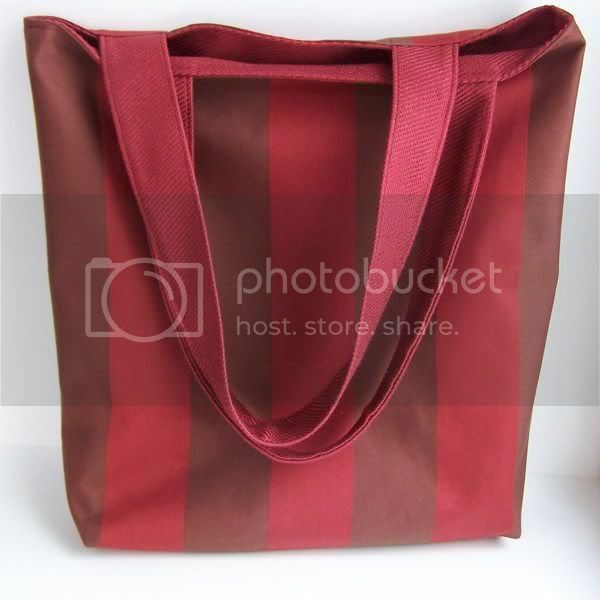 We'll gather lots of juicy tidbits ranging from inspiration to design and functionality. This week we're in for a studio treat! Jane Skoch of Maiden Jane provides an insightful tour of her office/creative space and offers up great advise for that constant issue of organization. At the end of the interview, be sure to visit Jane's blog as well as her Etsy shop. You'll be glad you did! Tell us a little about the work you do in the studio. Did you have a specific inspiration when organizing your space? My original “studio” was our kitchen table (our one and only table – we don’t have a dining room.) Every night at dinner, the machine would get placed on the floor. Eventually I had a sewing table in my bedroom which at least enabled me to keep my sewing work in progress. Several years ago, because of our growing family, we decided to add on to our home. 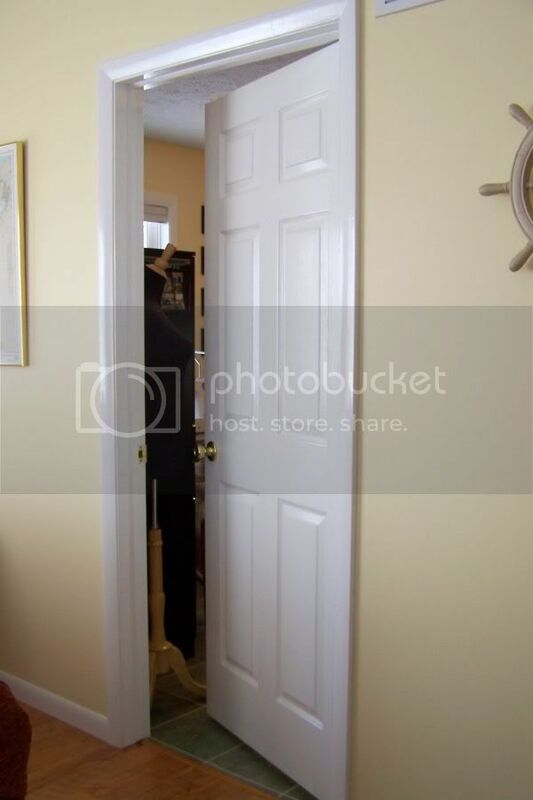 The builder encouraged us to have a walk-in closet or a glamour bathroom. I certainly did not want another bathroom to clean, so my husband and I decided that a family craft room/office was what we wanted. We have four kids, so we wanted a space that the entire family could use. 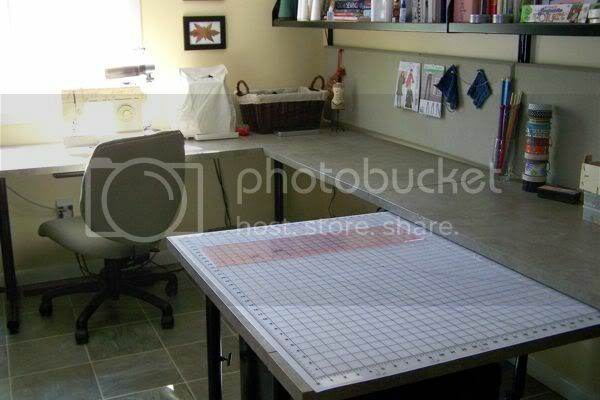 Not only is this a sewing studio, but it is an office for both my husband and I, a computer room and a craft room in which the kids can create. Name one (or more) things that work especially well for you? What’s your biggest issue with storage/organization/design? Space, of course. 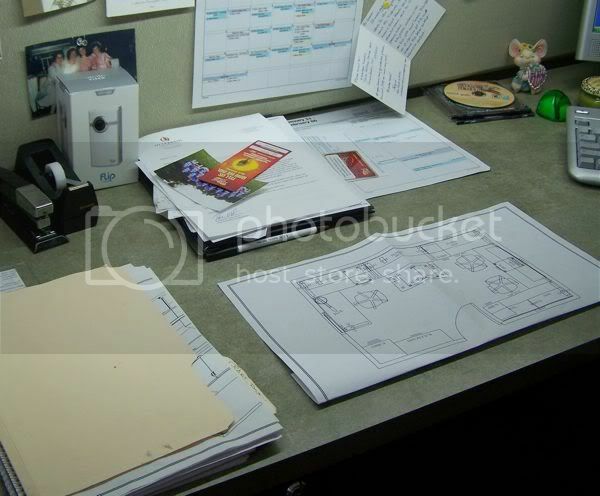 I like to have clear work surfaces, so I try to “go vertical.” I have a set of file folders, but, inevitably, I toss a paper on my desk which soon becomes a pile. The same thing happens with my sewing area. I might be excited to work on a new product, but a custom quilt comes along and before you know it, I have piles. 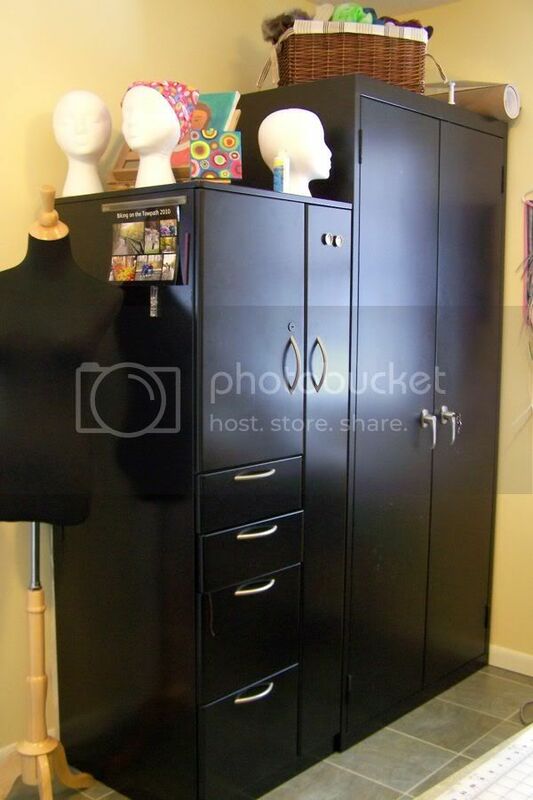 We selected a cabinet with a narrow storage bin. My ironing board can fit in it. However, most of the time I have it out. 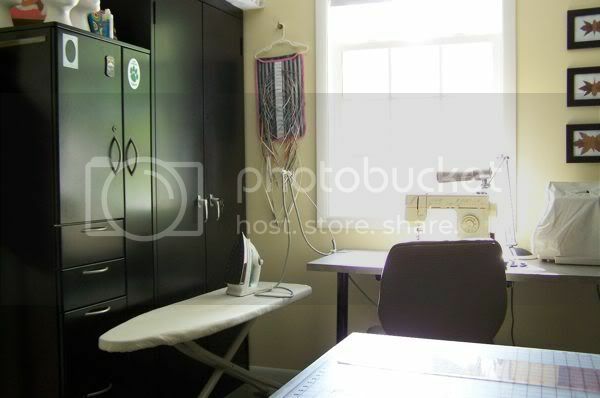 When we want to get into the other cupboard, we have to slide the ironing board out of the way. Level of importance: design aesthetic or functionality? Functionality wins. My sister-in-law is an interior designer that works primarily in commercial design. 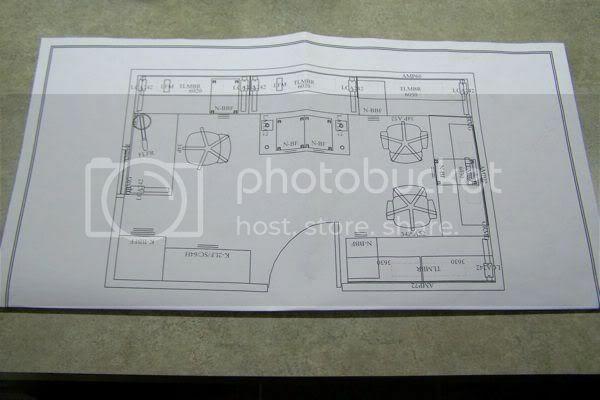 She helped us develop a floor plan that would help us meet our goals. She also suggested a furniture supplier that makes quality furniture but at an affordable price. We feel this furniture will last us a long time. My husband and I are both engineers, so we tend to be linear thinkers and quite pragmatic. My shop, Maiden Jane, is “where practical meets pretty.” Even though we like pracitcality we try to add pretty things when we can! 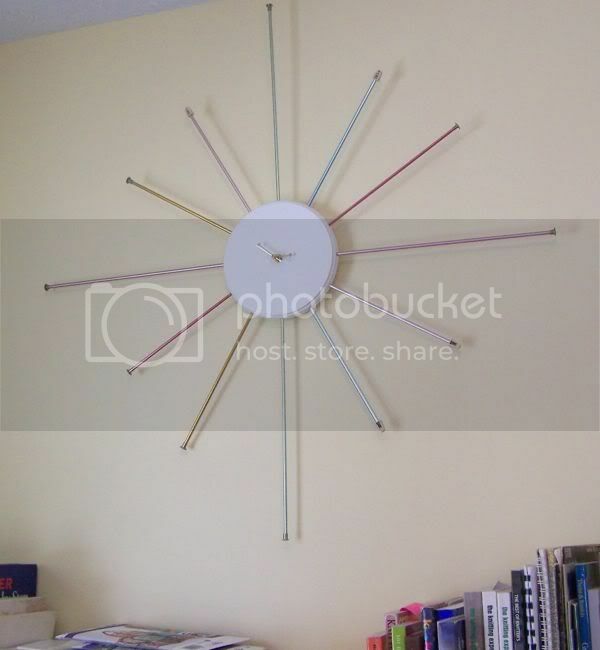 For example, my husband made this knitting needle clock for me last year so it provides a function, in a unique way, in our craft room. Is there something that you’re constantly working overcome and what have you done/do you do to rectify this situation? Yes. The computer! I like to use Twitter and Facebook and enjoy reading blogs for inspiration. However, if I’m not careful, hours can be sucked out of my day! Because the computer is in my craft room it is a constant distraction. I’d love any suggestions on how to better handle my time on the computer! 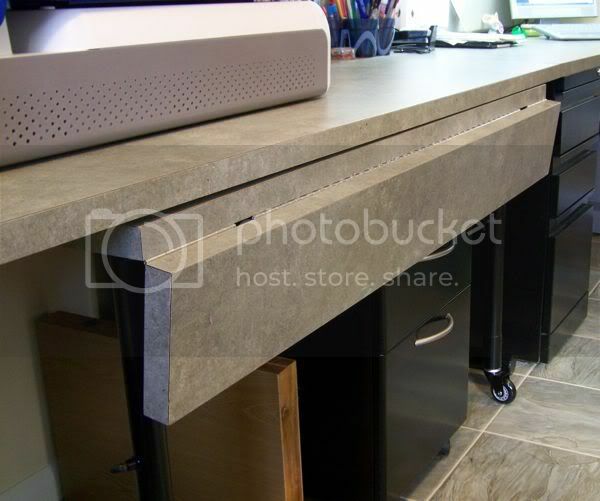 Also, the countertops are intended to be work areas. However, they tend to collect piles and before you know it, the entire surface is covered. When the clutter was simply taking over the room, I sprung into action with a quick plan which was a cheap and practical solution to the problem. 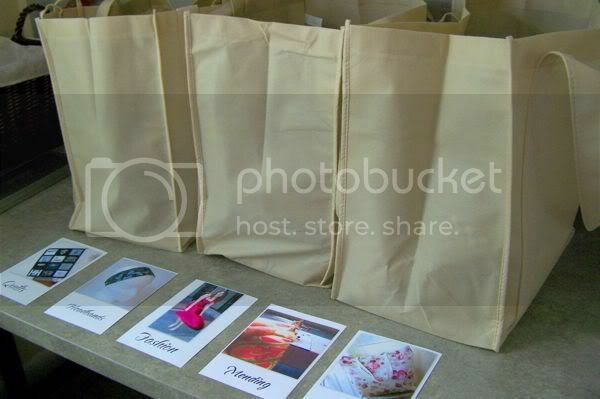 I gathered extra reusable grocery bags, stapled photos of the types of my common projects, placed the fabric piles inside and put the bags under the counter. 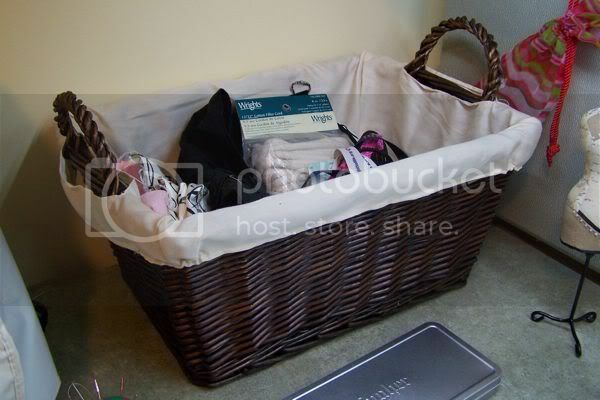 A single basket on the counter is intended for the most current works-in-progress. Do you use/prefer/need artificial light or natural light? I prefer natural light and have my sewing machine placed in front of the window. 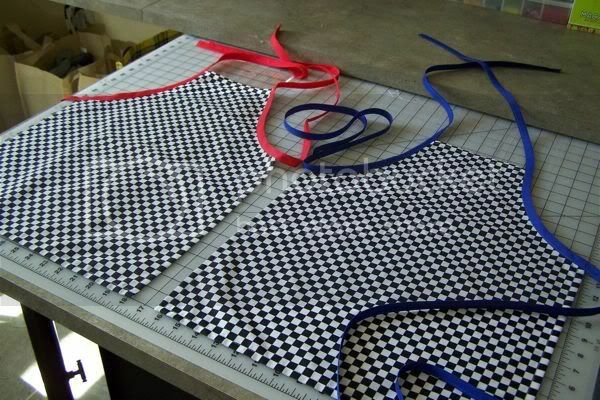 However, it is not adequate for my sewing. I use a swing-arm lamp with a CFL to apply light to what I am sewing. Our overhead lights are CFLs. We also have fluorescent lights under all the shelves for additional task lighting. Show me interesting tidbits about your studio. Flexibility was key since this room is trying to be so many different things for the family. - I wanted to be able to have a place to do a puzzle, but a puzzle wouldn’t fit on the wraparound counters. So the furniture representative designed a table with fold down flaps, wheels and adjustable legs! I love this table for a number of reasons. We can wheel it out into the living room or kitchen if we need extra table space. If we want to do a puzzle or play a game we pull up the end flaps and have a good-sized table. I can also raise the table to cutting height. The table can be placed in any position in the room – perpendicular to the counter, partially under the counter, parallel to the counter. Overall, it gives a lot of workspace for me and for projects the kids are working on. The best part, when we feel we need of breath of space, we clear it off and tuck it under the counter! - We have three office-type chairs. My sewing chair has no arms. We wanted the option for additional seating, so we purchased movable pedestals. 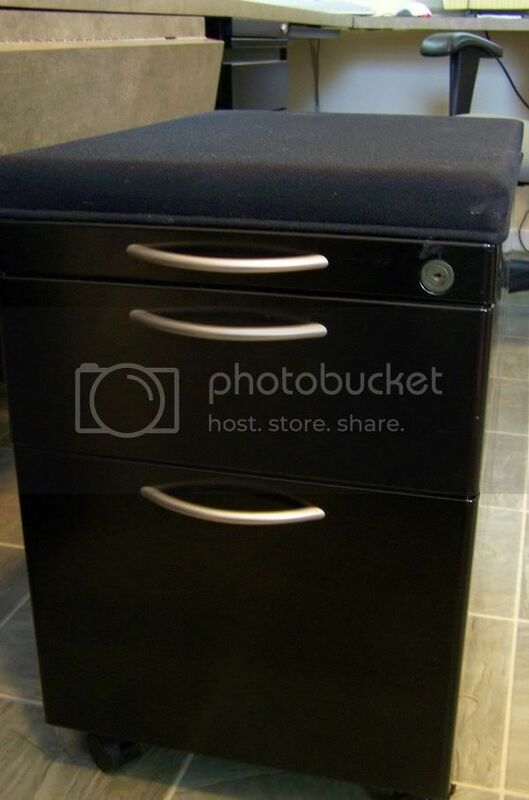 These are file cabinets with wheels and a padded top. 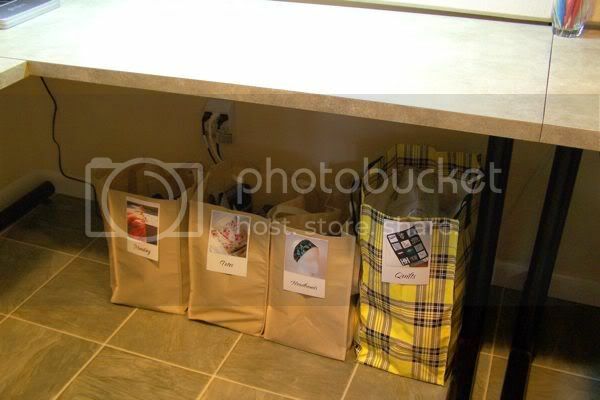 We have storage and the flexibility of using these as chairs as well as the ability to slide them under the counters. - Place things near where you use them. 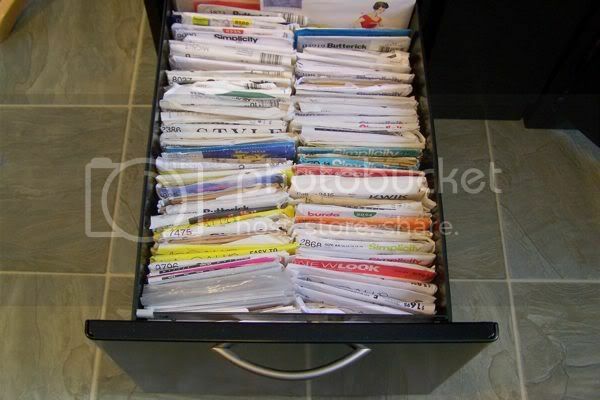 I keep my thread and patterns in file drawers. 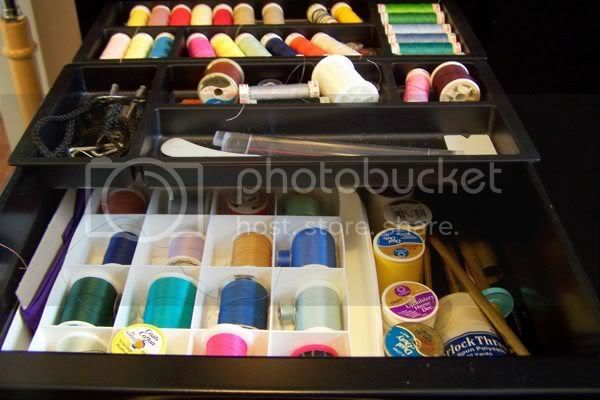 My scissors, bobbins, measuring devices, thread clips, are all in easy reach in the drawer underneath my sewing machine. How has your creative space evolved over time? My 14 year old daughter is a budding seamstress and avid crafter. She spends a lot of time in our shared room and also helps me clean it and/or rearrange it when necessary. We try to keep things in easy reach, so we have our color pencils, markers, etc. either out on the counter or in cigar boxes. 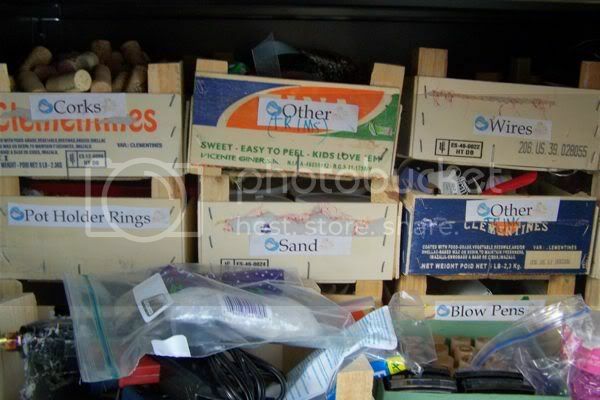 If we find we are not using something very often, we reorganize and place it in the large cabinet. How has having your own creative space affected your work? Having my own space has enabled me to be inspired. It has allowed me to leave a work in progress and know that I can go back to it at any time. 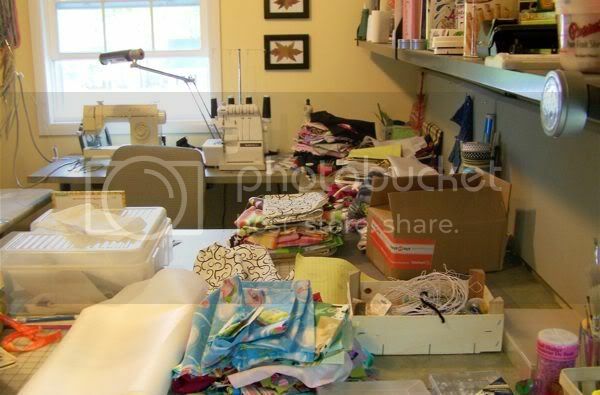 The best part of our craft room is that, should it get messy, we always can close the door. 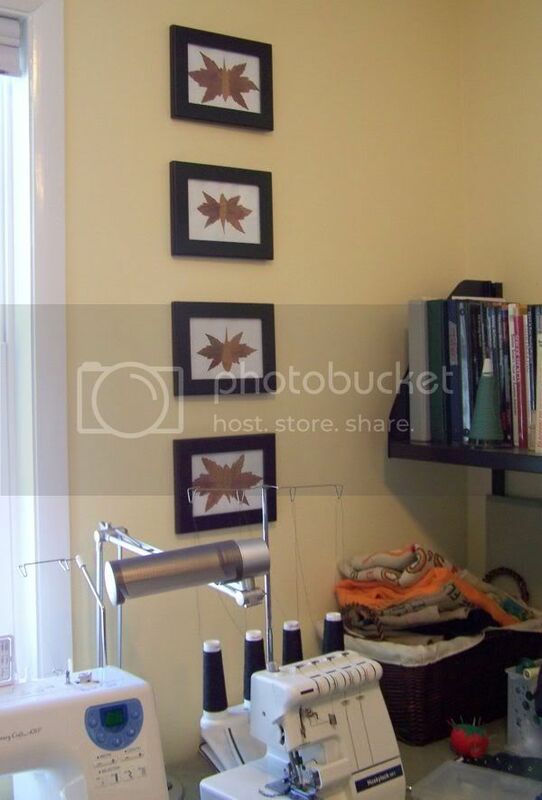 Jane, your studio/office space is wonderful! Thank you so much for allowing this tour! 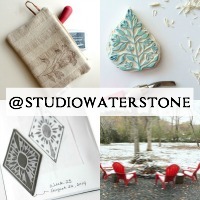 Interested in having your studio featured in Featuring Studio Spaces? Just click the little contact button in the upper right column and we'll set it all up! What a great idea to have a room that can be shared and used by the entire family! My favorite part was the mobile and adjustable table with folding flaps. I want one of those!!! What a beautiful studio! 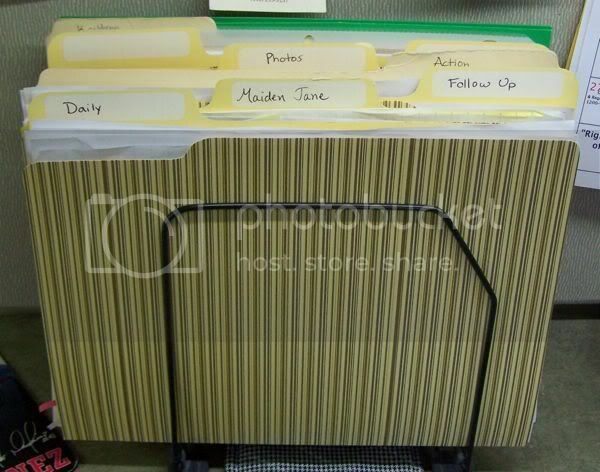 I'm so jealous of your organizing ability! Oh the counter space! I would love counters and flaps over all my various spaces now. So important to have your own space it took me sooo long to realize this! Featuring studio spaces has to be one of my favorite posts that you do (my favorite is when you do your demonstrations). I try and organize my studio this nice but 5 minutes after my "clean up" it resembles something completely different. There are some really great ideas here. Great space! We are in the midst of creating a multi-purpose hobby room in preparation for joining families with my expectant daughter and son-in-law and loved reading about your shared space. We are doing this with existing furniture and finding space to be quite a challenge. Love your suggestions for using items for more than one purpose and will surely do some of that too. Thanks for sharing!